When using the MPLAB® Code Configurator (MCC) to generate the peripheral setup for a project, the final MCC setup can be saved as a configuration file that contains all the settings selected by the MCC tool. This file is automatically added to a project. 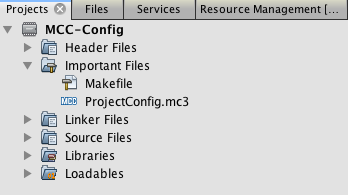 After completing the MCC selections for the various peripherals, you must click on the Generate button for MCC to automatically create the peripheral drivers and place them in the Header and Source folders of the project. 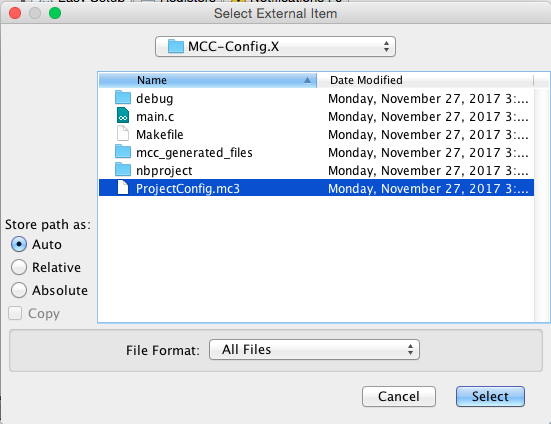 When running for the first time, MCC will open a window to allow you to save that configuration as a .mc3 file. You can change the default name of the .mc3 file. Once the file is renamed and saved, it will appear in the Important Files folder of the project. If another project is built using the exact same device, then a configuration file can be loaded and modified within MCC without having to start over with a new MCC configuration setup. MCC must be installed within MPLAB X to use the .mc3 configuration project. The .mc3 file must be set up for the exact same device in the new project. Select the .mc3 file you want to add to the project. This will add that .mc3 file to the project Important Files folder. MCC must then be launched to use or modify the configuration file. 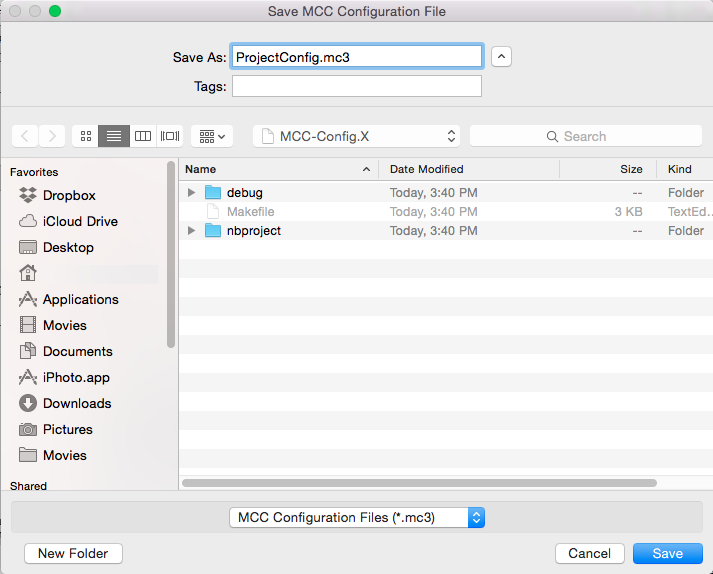 When the MCC updated configuration is ready, click on the Generate button to create the MCC generated Header and Source files for the project. The project can be built and programmed into the device based on that loaded (and modified) .mc3 file.